A lot of workout apps come preloaded with a crazy volume of obscure exercises, leaving the user scrolling aimlessly. Whilst in the gym, i want my workout partner app to be quick and highly efficient, as i like to maintain a good pace in the weights room. 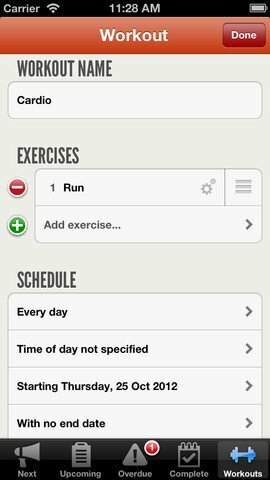 Workout plan lets you insert your exercises without the clutter and that works well for me. Workout plan has a decent scheduling service, which moves beyond the simple ‘back and biceps on a Monday’. I like the x number of days until I repeat feature, as this works well with my current routine which rotates 3 totally different workouts for upper body and the same for lower body. A lot of apps just aren’t built with this in mind, and I have previously been left thinking that they have been made by people who don’t actually train (or at least not seriously). This app is the first that i have actually found to be practical on the gym floor, and that’s a huge plus. Workout plan can remind me that I have missed a workout, perhaps due to an unscheduled day off. This makes it quick and easy to pick up my routine, without having to really think it through. For anybody who follows DC training, this makes it the perfect DC training app in my opinion. If you find that you have a bit of time at the end of your workout, then you can complete certain exercises from your next workout ahead of schedule. This sounds a little daft, but to put it in a useful context, I often do abs exercises after cardio. However, now if I have time after a weights day, I can do abs then instead, saving time tomorrow. A real winner.